In a month of big international news stories, Iraq has again dominated the headlines. Perhaps the most distressing report came from a British medical journal. The Lancet published the findings of a mortality survey conducted in Iraq by Professor Burnham and researchers from the Johns Hopkins Bloomberg School of Public Health in Baltimore and Al Mustansiriya University School of Medicine in Baghdad. The study estimated that about 601,000 Iraqis have died from violent causes since the coalition invasion of Iraq on 18 March 2003 until July of this year. They found that the pace of violent death has accelerated every year since 2003. President Bush immediately claimed the methodology “had been pretty much discredited” and the findings were “not credible”. Prime Minister Howard quickly said the results were “not plausible … not based on anything other than a house-to-house survey”. These were personal assessments unsupported by evidence. It is important then, to understand how the survey was done. The researchers used a sample representative of the entire country. Forty-seven residential streets from 16 of Iraq’s 18 Governorates were randomly selected. In each street, residents from 40 homes were asked about deaths of family members since January 2002. 1,849 households were visited and 12,801 people were surveyed. This is a large sample. The death rate recorded in these households during the period before the invasion was subtracted from the rate after the invasion. This represents the excess mortality attributable to the conflict. This rate was then applied to the populations of the Governorates to estimate the total excess death-toll for the country. Because the researchers did not visit every household in Iraq, the exact number of deaths since the invasion remains unknown. Any method less than a census—asking every household in the country—introduces a margin of error. We are all familiar with television ratings; most of us intuitively appreciate that we do not need to talk to everybody in the population to accurately estimate the true number of TV viewers. For the unfortunate Iraqis, sadly we can be confident that the war has caused at least 426,000 excess deaths from violence and possibly as many as 793,000. The true toll, however, is far more likely to be in the middle of this range than at the extremes. Sampling, when conducted according to strict statistical criteria as in the Iraq survey, is the only tested, valid and practical way of gathering data in insecure settings. Because surveyors actively looked for reports of deaths from Iraqis themselves (92 per cent could produce a death certificate), rather than counting corpses brought to morgues or news agency casualty reports, we expect they would record higher numbers than many other well-publicised methods of counting bodies. Putting aside the notion of what may constitute a plausible death-toll in times of conflict—the evolution of warfare throughout the 20th century should have taught us much about the increasing impact of war on the health of civilian populations—house-to-house surveys are in fact the standard and best means of determining population mortality rates when routine systems of data collection collapse. The US Congress should agree: in June this year they unanimously passed a bill outlining financial and political measures to promote relief, security and democracy in the Democratic Republic of Congo. The bill was based in part on the veracity of a survey conducted by the Burnet Institute (Melbourne) and the International Rescue Committee (New York) that found 3.9 million Congolese had perished because of the conflict. This survey used the same methodology as Burnham and his associates. It also passed the scrutiny of a UK parliamentary delegation and the European Union. Other mortality studies in Darfur, Kosovo and Afghanistan have employed identical methods and their findings have been accepted by the media, UN, and governments throughout the world. The US government actually funds training of the humanitarian community in this methodology. As Burnham’s colleague Les Roberts has said, "it is odd that the logic of epidemiology embraced by the press every day regarding new drugs or health risks somehow changes when the mechanism of death is their armed forces". Although a nationwide census may ultimately be the only way of conclusively counting the human cost of this war, Burnham and colleagues have bravely given us a sound scientific estimate of the magnitude of Iraqi suffering. In the interests of the Iraqi people, of regional and global security, and of the victims of future wars, the Lancet survey should not be unthinkingly dismissed by any of us. I do not understand how the methodology of one report is acceptable but then that same methodology is later found to be unacceptable. Sounds to me like politicians trying to avoid uncomfortable facts. I think the coalition of the willing was, on balance, still correct to go into Iraq in 2003. While I can't deny that what has happenned since then has become more and more of a disaster, Saddam was an evil dictator who deserved to be brought down. I don't know that current strategy is working brilliantly, but i think the coalition has to stay the course, in order to guarantee victory. What I would like to know is if these figures are correct, who is responsible for most of the deaths of Iraqis? Is it the coalition? The Sunni militias? the Sadr army? Al Qaeda? I think you are deluding yourself Andrew Johnson. The point is not who is responsible - the point is how can it be stopped. Obviously the perpetrators need to be identified, but insurgents will keep coming out of the woodwork until the root causes for the insurgency are faced up to. America has to bring in Iran and Syria and partners, and further, it HAS to force Israel to make peace with the Palestinians -these are sine qua nons for peace. By the historic principals of just war theory (essential religious & ethical principles for determining how, when, and by what means any war should ever be considered just, now codified in International Law) the US invasion of Iraq was (1) based on false and misleading information (Iraq supposedly had nuclear weapons, and the "smoking gun could soon become a mushroom cloud" according to Secretary Rice). Although the veracity of such information was seriously criticized both in the US and England, both administrations chose to ignore such criticism, and therefore based a unilateral foreign invasion on false premises (2) All credible diplomacy and nonviolent means of resolving the conflict had NOT been exhausted (also a requriement of just war). Hans Glix has continued to say that they inspections were working, and the IAEA needed more time, and international support, to continue carrying out their mission. These inspectors were summarily warned and dismissed by the US coalition just before the invasion, with no further deliberations by the UN (3) The UN is the only appropriate international authority for engaging in the suppression or deposition of a dictator or totalitarian leader. Sadaam Hussein was clearly a dictator. But by the principals of just war and international law, the US Coalation had no right to intervene unless they were under imminent attack, and we were not! (above) (3 Just War also includes the important principals of (a) proportionality (the violence done to an enemy must be proportionately less that the potential or real violence the enemy is prepared and able to engage in). 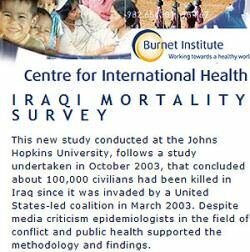 The Lancet study clearly tells the truth about this, with respect to Iraqi casualties. (b) Civilians and noncombattants must not be targetted, killed, tortured, or otherwise harmed by any party engaged in a just war. Again, the Lancet study, the tortures at Abu Gareib, the bombing of civilians in Fallujah, and the intentional targetting of Al-Jazira and the(still disputed) Palestine Hotel all point to persistent, and sometimes deliberate, premeditated targetting, bombing, and torture of innocent civilians and noncombattants by the Coalition forces. Under such circumstances, we have no moral authority, or political credibility, to further "protect" the Iraqi people through our own armed forces. The only just military solution would be for the coalition to set a date for withdrawl, and engage the UN, the Arab League, other Muslim nations, and Internaional Relief agencies in a coordinated international effort to establish peace in Iraq, at least until the government there is capable of funtioning. More of the same will not work. Adding further violence and occupation to an already unjust and violent situation would simply add salt to an already enormous, and tragic wound. The failure of pre-emptive military intervention are now glaringly obvious. It is high time for both the English and the Americans to elect new leaders who will resolve this tragedy as fairly and truthfully as possible, and lead the world by example, through comprehensive nuclear disarmament and sincere support for a UN-led force for peace.